Another instalment in my photos from ten years ago series – this time it is July 2008. At North Melbourne station work was continuing on the new concourse, with a massive steel and timber crash deck at the city end of the platforms allowing construction to continue while trains continued running below. While in the rail yards next door I found a since-retired Hitachi train shunting into the sidings. In both views note how much sparser the CBD and Docklands skylines are – the current explosion of apartment developments had yet to take off. 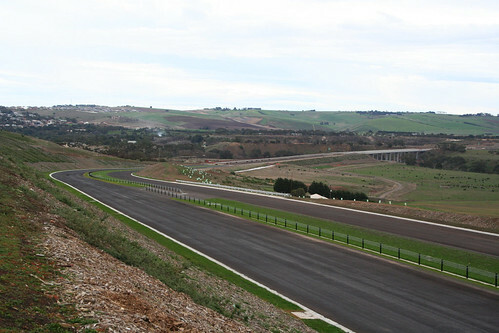 Down in Geelong the first two stages of the Geelong Ring Road looked ready to drive on. With only the white lines remaining to be painted. I mentioned crate men recently – and July 2008 saw a plague of them across Melbourne’s west. Jumping a fence at Newport. Atop the WC Thomas & Sons flour mill. Riding a crane in Spotswood. And having a smoko atop a South Kensington roof. I also spent a morning at Newport photographing a procession of citybound trains. First was a V/Line train hauled by diesel locomotive A62. This unit has been stored since 2013, and probably won’t run again. I also saw A85 with the Waurn Ponds – Lyndhurst cement train. 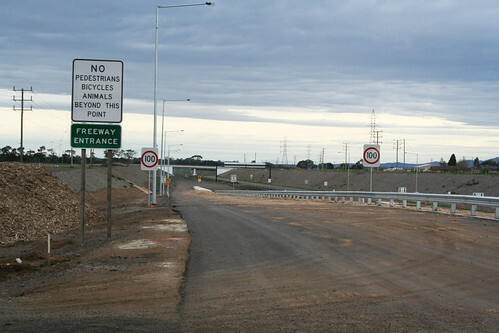 The last cement train ran to Lyndhurst on the Cranbourne line in 2009, with the traffic moving completely to road in 2015. And finally the train I was waiting for – The Ghan liveried locomotives NR74 and AN3 on a freight train ex-Adelaide. Given The Ghan runs between Adelaide and Darwin, what were these two engines doing in Victoria? The answer is simple – they were due for scheduled maintenance at the workshops in Melbourne, and the easiest way to get them there was to pull a freight train headed this way. At Southern Cross Station massive advertising banners are nothing new, but back in 2008 a company called Intralot was. July 1 saw the company start operations in Victoria, selling ‘scratchie’ lottery tickets in competition with incumbent operator Tattersall’s, after winning 10-year licence from the state government. By 2010 their Victorian operations were bleeding money, leading the company to sell out to Tattersall’s in 2014, restoring the previous monopoly status. And I end this month with a train trip north from Seymour, to the Murray River town of Tocumwal. Normally only traversed by freight trains, I was travelling on collection of museum pieces restored by the Seymour Railway Heritage Centre. Our train had a V/Line locomotive up front to assist. And what looked to be the entire town of Tocumwal coming out to greet us. On the way we passed the station building at Murchison East. Destroyed by fire in 2014. Destroyed by fire in 2018. North of Shepparton we passed oil terminals that were once served by rail. As well as a fertiliser depot, the rail siding covered with rust. But it wasn’t all doom and gloom for rail freight – the container terminal at Mooroopna was still being used to load freight trains. And the railway line itself wasn’t being neglected. With track crews hard at work. Allowing the thrice weekly freight train to Tocumwal to keep running.